The work ‘Family’ was made in 1994. This series of images of my sister and her three children presents a narrative of childhood containing both joy and imperfection. ‘In This Place’ updates the story of the children and where their lives have taken them as adults. In the intervening years, their mother has died and they have all started their own families with seven children between them. All have moved from one housing estate in Central Scotland poised to undergo urban regeneration, to another in the same town, where they live in similar flats in random pockets that have yet to be touched by redevelopment. Fundamentally, this is a story of people’s lives: what they do and what they want. Where the ‘place’ is both mental and physical: where we put ourselves and where we are put, sometimes by others and sometimes by circumstance. What puts us there, what keeps us there, and do we want to be there? These are the central questions of ‘In This Place’. ‘Family’ initially began as a project on my sister and her experiences as a parent but quickly became a story on children and their childhood world that I was allowed a glimpse into. This was a world at times both tender and tough, loving yet bewildering. The three children had a distinct inner and interconnected world, existing within a cocoon of support for and from one another. All their experience was interdependent on the other, and their mother was only really there on the periphery – to feed and to clothe and to wash – but their actual lives were fundamentally lived with and for one another. At the time, I thought it not important that this was part of my own extended family yet by calling it ‘Family’, I still wanted to claim the photographs whilst leaving it open to interpretation. My sister is dead now and her children are adults with their own children and their own families. So the family renews. It endures. With the death of my sister, a further loss presented itself – a growing disconnection from her children and especially from her grandchildren that I wanted to repair. Although most of my work is not personal, I appreciate that photography has allowed me into so many people’s lives, so perhaps it is what I turn to – it is the excuse, the reason, and the justification to be there. Or at least a possibility, an entry point to grow from. So began ‘In This Place’. Looking at family and home, connections and place and touching on issues of social and personal inertia. Behind my personal connection sits a larger narrative of social mobility, environment and choice. Do we have choices in life or are some predetermined to an extent and made for us? Life feels somewhat static in the housing estates of Central Scotland. Motionless. Immobile. Within this social landscape all that has changed for the children from 1994 is movement from one area scoring high in The Scottish Index of Multiple Deprivation to another. A simple bus ride across town. 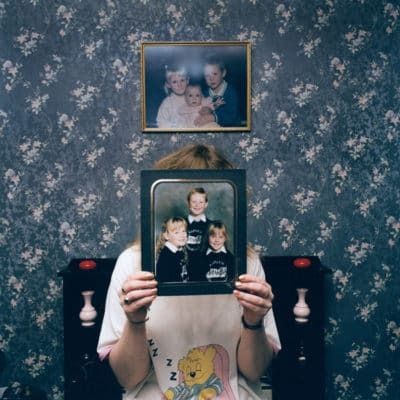 Yet against this backdrop of parental loss and limited life options there is a glue that binds the original three children together – living in similar flats, in the same area – intertwined and interdependent as they were in 1994. Together, they are and remain, ‘In This Place’. Margaret Mitchell is a photographer based in Glasgow. Her overarching interest lies in people and their stories, with childhood, youth, place and belonging often explored in the people and places photographed. She often photographs children and young people - people in the midst of establishing a sense of self; sometimes being in transformation from one state to another: child to youth to adult. The inner and lived worlds of others are central to her photography with her work seeking to portray the individual and their experience(s). Her work has been exhibited widely, including at the European Parliament and at the National Portrait Gallery as part of the Taylor Wessing Photographic Portrait Prize. Alongside her own photographic practice, her interests span curating, teaching and participatory arts practice. She set up The Story Portrait, an online journal where photographers discuss one of their portraits. She previously lectured for over a decade in photography and continues to work within community and collaborative arts settings.